Go nuts with our nutty sticky buns and enjoy gooey perfection! 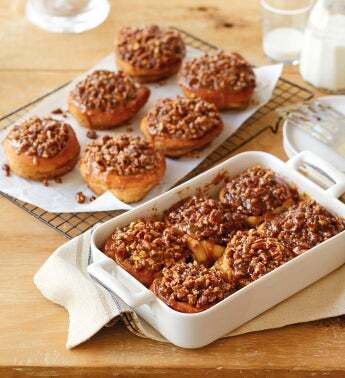 Crisp pecans and buttery brown sugar top off soft dough to produce 12 delicious sweet rolls just waiting to delight. With a dozen scrumptious nutty sticky buns, this is a great gift for a family, for an office or for yourself to pull from the freezer when your friends stop by for tea. Simply reheat and serve for an easy gourmet breakfast, brunch or dessert.